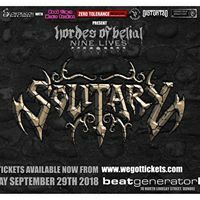 Headlining the ninth incarnation of Hordes Of Belial, Preston-based thrashers SOLITARY [8/10] take the stage and burst into an extended set of high-octane aggression. British thrash is often overlooked in favour of the genre’s American and German counterparts, but by no means take that to mean there’s nothing worth finding in the UK thrash scene. SOLITARY stand as ample proof of that. Though their set was a touch anti-climatic after KING LEVIATHAN‘s cathartic blast of excellence, the Preston thrashers delivered a ferocious set that would rival any of the Bay Area’s better known acts. Still hungry from the release of their third LP The Diseased Heart Of Society in 2017, and the re-release of their debut album earlier this year, the four-piece delivered aggressive, shredding fun in spades.